Under eye bag treatment – small “dot” scabs formed by the plasma will drop off after 4-8 days – eyes cannot be over tightened or over corrected as the treatment naturally tightens only excess, loose skin. Treatments suitable for men and women seeking an alternative to eyelid surgery (blepharoplasty) to lift or smooth heavy, hooded or double eyelids and to reduce eye bags, crow’s feet wrinkles around the eyes. 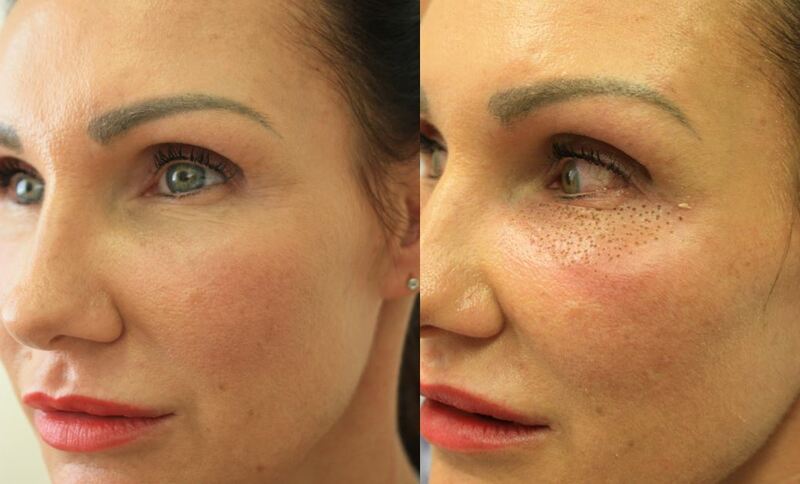 What does a Plasma eyelid lift or Plasma treatment involve? The area to be treated will be cleansed, sanitised and anaesthetic cream applied to numb the area. We include Dermalux LED light therapy to which contributes to the healing response. The hand held plasma tool produces a tiny flash of Plasma “lightening” which vaporises away a “full stop” size dot of skin to a superficial depth. This stimulates the skin to contract creating the tightening effect and initiate the natural healing process resulting in new tighter skin being produced. See our treatment video below. With eye lid lift / eye bag treatment you can expect swelling which can last 48 hours, this is a natural response. The application of recommended soothing post treatment creams and SPF is recommended. Written aftercare instructions will be given at your consultation and after treatment. We recommend an appropriate cosmeceutical skincare routine to support and maintain treatment results. Consultations with Diane Nivern or Dr Joshua Nivern MBChB BSc.